"I've owned numerous crates over the years. The Variocage is by far the sturdiest and best designed crate for travel I've seen or had. Assembly was easy. Fits my SUV like it was made for it. I would recommend this to anyone!" - Daniel B.
Bumper Cover & Mat - Protects your vehicle from scratches and dirt while protecting your dogs from slipping while entering and exiting the cargo area. It can also be used to cover the front of the Variocage double. Spill-Proof Water Bowl - Gives your dogs access to fresh water during your trips without the mess of a wet cage! This model is the Variocage Double, is designed for more than one dog and features a movable center divider that is easily adjustable if one of the dogs needs more space. The back section of the center divider will adjust and lock diagonally giving your larger dog more room. If you have a large dog or if you want to give a single dog more space, this center divider is easily removed. The Variocage comes in a total of 7 adjustable sizes and there is sure to be one that fits your vehicle and the needs of your dog. To see which model will work best for you please see our links below. Why buy a MIM Variocage? Variocage is the ONLY dog cage in the WORLD crash tested and certified for front, rear, and roll over impacts that protects BOTH human and dogs alike in the car. Not only that, we offer Free Replacement of any Variocage - After a Properly Documented Accident! According to a recent study by AAA, about 65% of owners who drive with their dogs admit to reaching for, petting, feeding, or taking pictures of their dogs while driving! When we consider the fact that it takes only two seconds of unfocused driving to double your risk of an accident, and that there were 3,328 deaths and an estimated 421,000 injuries due to distracted drivers in 2012, it's easy to see how driving with an unrestrained/unprotected animal is a serious hazard. On top of this, even a small 10 lb dog can become a deadly projectile in a car crash. While many pet travel safety products exist, the Variocage Dog Travel Crate is by far the safest way to transport your dogs. Each model has gone through rigorous testing and has proven to withstand all different types of collisions, making it the ONLY CRASH TEST CERTIFIED AND APPROVED DOG CAGE on the market (based on stringent UNECE standards). The video below illustrates some of the features of the Variocage and how it is engineered to reduce the risk of harmful or fatal injury to all occupants of the vehicle in the event of a collision. Variocages were designed and engineered by MIM Construction, a Swedish based ISO 9001 certified manufacturer and maker of high quality and heavy-duty crash safety equipment for the automotive industry since 1986. Each Variocage is constructed of industrial grade stainless steel designed for optimal durability, and is finished with a sleek powder coating for a great look. Get a Variocage today, and protect yourself, your family, and your pets from the potentially devastating effects of an automotive collision. Variocage products are very difficult to re-pack and return without damage. Customers who use our measuring guides and call Pet Pro Supply Company with accurate measurements for their dog and their vehicle will receive our sizing guarantee. We will accept full responsibility for exchanges and/or returns for any Variocage that has our sizing guarantee. Per our Return Policy, we cannot accept returns for improperly sized Variocage products unless we are at fault for shipping the wrong model or the wrong product. *MIM Variocage L+ and XXL+ Size: Variocage Double L+ offers the same width and depth as the next size up, but feature a slightly lower height to accommodate vehicles such as a Volvo V90, Mercedes E Class Wagon or similar vehicles that are limited by the height of cargo door frame. Why do I need Dog Safety Equipment? According to a survey by the American Automobile Association, 84% of drivers who transport their dogs in a vehicle do not use a proper safety restraint. Traveling in your vehicle with an unrestrained pet not only increases the risk of serious or fatal injury for your animal companion, but for the vehicle’s human occupants as well. An unrestrained dog can be a distraction while driving, increasing your risk of having an accident. In the event of an accident, an unrestrained dog will impact whatever it hits with a force equivalent to several thousand pounds of energy. In an accident, an unrestrained dog may be ejected or escape from the vehicle resulting in the dog getting lost, injured or killed. Once outside, the dog can become a hazard to other drivers and is at risk of being hit by another vehicle. After an accident, an injured or frightened dog can pose a threat to emergency responders, preventing them from helping human occupants that may be in need of assistance. Traveling safely and responsibly with your pet is not just about reducing the risk of harm or fatal injury to your dog, it is about the safety of human occupants as well. You owe it to yourself, your passengers and your beloved pet to make everyone’s journey as safe as possible. Why choose MIM Safe Variocage? MIM Safe Variocage is the only cage on the market today that has been crash tested for performance in front, rear, and rollover collisions. It has additionally been subjected to a drop test that simulates a vehicle rollover. The crash tests were conducted by the Technical Research Institute of Sweden. In all cases, the Variocage outperformed all other cages on the market and met or exceeded the safety standards applied by the testing organization. MIM is one of the only Pet Products company in the world that employs a team of Crash Safety Biomechanics Engineers on staff. Their background includes work as crash safety engineers for Volvo, Volkswagen and the Swedish Government to name a few. MIM Safe Variocage is adjustable. You can adjust to compensate for differences in vehicle cargo areas. This can be a great advantage if you need to change vehicles. Variocage includes a built-in key lock for security. Pet owners also have the ability to secure the cage with a padlock. MIM Safe Variocage features an escape hatch. This very important feature allows you to remove your dog from the vehicle after a collision in the event the cage or vehicle hatch will not open or if your keys are unavailable. How does the MIM Safe Variocage compare to other dog cages? The MIM Safe Variocage is constructed of steel with telescopic tubes and two individual parts for the floor and roof, which allows for adjustment of the cage length. This adjustable feature also benefits crash safety by working with the vehicle's crumple zone. In a rear-end collision, the floors, ceilings and the telescopic tubes will be pushed together. This reduces the risk of injury for all vehicle passengers – canine and human. When MIM Safe crash tested a regular steel cage with a solid frame, it broke the back seat. The MIM Safe Variocage has a crumple zone just like the car, which means that it will deform – just like your vehicle will – in reaction to a severe impact. This feature allows the rear seat to remain intact reducing the risk of injury to humans. The MIM Safe Variocage also reduces the risk of injury to your dog because it is designed to minimize puncture wounds and lacerations from the cage material. The structural integrity of Variocage prevents your dog from becoming a dangerous flying object, being thrown from the vehicle or escaping after an accident. The escape hatch allows you to easily remove your dog from the cage in the event that the rear cargo door cannot be opened. In the above photo, taken shortly after an accident, the vehicle has been heavily damaged and the driver was taken to the hospital, but the dog traveling in the MIM Safe Variocage survived in perfect health. Over the past twenty years, MIM Construction AB has designed and manufactured over 350 crash tested automotive safety products that are effective in reducing the risk of serious injury or death for drivers, passengers, and pets. MIM has gained extensive experience and knowledge from hundreds of crash tests where MIM designs and products have been utilized. Variocage is based on MIM's experience in the production of auto safety products and accessories. Variocage incorporates the same crumple zone engineering principles used by automobile manufacturers to reduce the potentially devastating impact of a serious collision. The Variocage Single is safe and very practical. It is designed to provide protection while leaving sufficient space for other cargo. In a rear-end collision, the cage will compress in a controlled manner, just like the crumple zones of the car. This prevents the rear seat-back from being penetrated or pushed forward by the cage, thus minimizing the risk of damage to both the passengers and the dog. If you are unable to open the Variocage front door, the escape hatch can be used. With a few simple steps, you can easily remove your dog. MIM Variocage products have undergone exhaustive and stringent tests performed by the following U.S. and International Safety Testing Organizations. 4×4 North America, Inc (the exclusive North American distributor of Variocages handles all warranties. Warranties of all MIM Construction products is in effect for Three (3) years from date of purchase. To be covered by the warranty, the defect must be an original manufacturing defect. The warranty does not cover any damage, mis-use or modifications by consumers nor does it cover damage from animals, drops, falls or impacts. PLEASE NOTE: If you have any questions at all about measuring or sizing, please Contact Us! We cannot guarantee a return if the incorrect size Variocage is chosen without our recommendations. A. Measure the length of your dog, from the tip of the nose to the rump or base of the tail, then add 3 inches to the measurement. The calculated length should be at or shorter than the Variocage's max length. B. Measure the height of your dog, from floor to the top of the withers (high spot on the back above the shoulders), then add 3 inches to the measurement. The calculated height should be at or shorter than the Variocage's height. It is important to measure your dog first before measuring your vehicle. Proper fit for your dog is vital to your dog’s comfort and safety. Here are some helpful hints when measuring your dog for a Variocage. Hold the measuring tape in one hand and place the free end at the front edge of your dog's nose pulling it straight back to the base of his tail. This will give you the length measurement for your dog. You will need to add Three (3) inches to allow the dog room to turn around in the cage. Place the tape at the top of the shoulder and measure down to the floor to get a proper height measurement. Add Three (3) inches to give the dog plenty of room if he wants to stand up. Be sure to estimate your dog's adult size if you order his crate while he is still growing. You can check his breed standard to get an estimate of what size he will reach at maturity to make sure your crate is large enough. Proper measuring will assure that your pet can comfortably stand, sit, turn around, and lie down in his cage. You can always add a divider panel in the MIM Safe Variocage Double if necessary, and reserve the remaining space until your pet grows into it. As a general rule, if you're not sure which size to select, choose a larger size. It is OK to go size a Variocage 1 size larger in almost all cases. The bars are spaced in the Variocage according to the breed size that typically fit in a specific Variocage Model. For example, our smallest MiniMax Variocage is suitable for small toy breed dogs but it can also be used to transport cats safely. The MIM Variocage is suitable for use in Station Wagons, Crossovers, Minivans, Vans, and SUV's. The Variocage is also angled towards the top on both the front and the back of the cage and is adjustable in length so it can fit in a variety of vehicles. The slope of the front and back of the cage is approximately the same as the slope of the backseat of most vehicles. The roof of the cage is shorter in length than the floor in consideration of the angle of the back seat, as well as the angle of the rear entryway door. Measuring length as indicated above will provide for a proper fit in almost all suitable vehicles. The roof of the cage is also narrower in width than the floor to allow for a proper fit in almost all suitable vehicles. Check to see if your car has a raised sill at the rear cargo entrance. If the sill is raised, you should put something flat under the cage so its doors can open correctly. We recommend rigid foam board insulation to minimize interference with your car’s crumple zone. The floor of the cargo area should be flat. (C) Measure the height from the cargo floor to the lowest point at the top of the cargo door entrance (Note: Be sure to measure from the top center of the door frame straight down to the floor not at an angle). You may also use the manufacturer's Vehicle configurator below. This vehicle configurator is based on European model vehicles which may differ slightly than American car models. Very few American vehicle models are included. You may use this configurator as a point of reference, however we absolutely recommend you double check the measurements of your vehicle to find the best sized Variocage. 2 Dogs without a Divider in a Double or 1 Dog in a Double without the Divider provides more room for the dog(s) in some cases. For safety reasons, Foam Board Insulation may be recommended for use to raise the cage a few inches … or to support the cage across a floor gap. We NEVER recommend traveling with a Variocage installed improperly. The 2nd row rear seats must be in the upright position and the Variocage placed against the rear seat. The Back End of the Variocage must be placed up against the rear seat. We can explain the Crash Engineering Principles behind our cages and will explain the importance and safety of a proper installation if you call us. MIM Construction Variocage is the only crash test certified and approved dog cage on the market and the most rigorously tested and proven dog transport cage in the world. The Variocage comes in 4 adjustable models and 14 sizes; there is sure to be one that fits your vehicle and the needs of your dog. The Variocage Single is safe and very practical. It is designed to provide protection while leaving sufficient space for other cargo. The flexibility of the Variocage can easily be tailored to the dog and the vehicle by the owner. Click here to see the Assembly Guide. The Variocage Double features a movable center divider that is easily adjustable if one of the dogs needs more space. If you have a large dog or if you want to give a single dog more space, this center divider is easily removed. The flexibility of the Variocage can easily be tailored to the dog and the vehicle by the owner. The Variocage MiniMax was designed with all of the safety features of the larger models, scaled down to protect smaller pets. Its bars are closer together to prevent smaller dogs and cats from escaping or poking their heads out between bars during transit. The smaller footprint also leaves considerable space for additional cargo and can also fit a wider variety of vehicles. The Variocage Compact is designed for use in vehicles that have a threshold (or sill) at the rear cargo door, such as hatchbacks. The Variocage Compact features a raised front door which is designed to clear the vehicle’s threshold without requiring special mounting or a platform. Its smaller size also leaves considerable space for additional cargo. Transform your cargo area into a spacious, and secure environment for transporting your dogs! When used with a dog barrier at the front of your cargo area, such as our Traffic Guard Universal Dog Barrier, the Variogate Universal Cargo Barrier allows maximum use of your car's cargo area while creating a safe containment area for your dogs. 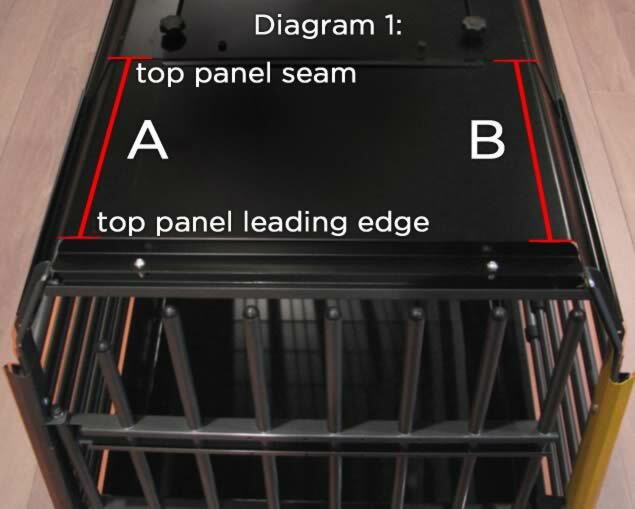 What makes the MIM Safe Variocage the safest animal transport cage on the market? Will the MIM Safe Variocage fit in my vehicle? How can I choose a Variocage that is the correct size for the safe transport of my dog? How do I calculate the inside dimensions for a Variocage model I am interested in purchasing? What is the correct way to install the MIM Safe Variocage in my vehicle? Why is it recommended that the cage be up against a rear seatback when installed in a vehicle? Can the cage be installed anywhere else in a vehicle other than behind the rear seat? What if I have a Minivan or SUV with 2nd row captain's chairs? Why are the outer poles on the front of the crates shorter than the rest? Can I carry two (2) dogs in a double cage and keep them separated from each other? Can I carry more than two (2) dogs in a double cage and is it safe? Can I use a Double Variocage without the divider to allow more room for a large dog? Are there any breeds you do not recommend putting in the MIM Safe Variocage? What type of steel is used to make the Variocage? Do I need to use the straps that are provided with the Variocage? Can the Variocage be used in a Pickup Truck? Can the Variocage be used in an RV or Mobile Home? One of the steps in the Variocage assembly manual is putting "soft material" 20mm underneath the kennel before you place it in the cargo area. What would you recommend for this "soft material"? MIM Safe has developed over 350 crash tested safety products for the automotive industry. All products meet the strict requirements of automotive manufacturers and European regulatory agencies for crash safety. This experience combined with a passion for safety engineering makes MIM Safe a leader in crash tested safety products.Steel Construction - MIM Safe Variocage is made of steel. Most other cages are made of wire mesh, plastic, or aluminum. These materials do not provide the same level of protection, durability, or strength as the MIM Safe Variocage. Escape Hatch - MIM Safe Variocage features an emergency escape hatch. This important feature allows you to fold down your rear seats and get your dog out of the cage after a rear end collision. In many cases, especially after a severe impact, the rear hatch or door of a vehicle cannot be opened easily. This critically important feature allows you to get to your dogs, remove them from the vehicle, and if need be, tend to them after a collision. *Crash testing and evaluation performed by The Technical Research Institute of Sweden. Crumple Zone Protection - MIM Safe Variocage is the only cage designed to work with your vehicle's crumple zone protection. The crash testing and crumple zones are critically important. These help protect both dogs and humans in the car. A rigid cage can be dangerous to both your dog and human occupants in the event of a severe impact. Adjustable Fit - MIM Safe Variocage is designed to be adjustable. The adjustability is not only crucial for safety (crumple zones), but is also allows flexibility for placement in your vehicle or across multiple vehicles. MIM Safe Variocage will fit your lifestyle and provide you with many years of safe and reliable service. The MIM Safe Variocage is suitable for use in Station Wagons, Minivans, and SUV's. The Variocage design, features and adjustable length allow it to fit in most suitable vehicles. The Variocage is angled to match the slope of the back seat and the slope of the rear cargo door. The roof of the crate is also narrower in width than the floor. These features allow for a proper fit in almost all suitable vehicles. You may also use the manufacturer's Vehicle Fit Guide: MIM Vehicle Fit Guide. However please be aware that the manufacturer's guide is based on European vehicle models which may differ than American car models. Please Contact Us if you are unsure of the best way to measure. There should be enough room for your dog to be able to stand-up in the cage. There should also be just a few inches of clearance from the base of the tail (not the tip of the tail) to end of the cage. These clearances are perfectly normal for the Variocage when used for safe transport of your dog. Oversized is NOT better, especially when it comes to safety. The Variocage should be just large enough for your dog to walk into the Variocage, turn around, and comfortably lay down facing towards the back cargo door. This is the absolute safest position for your dog in the event of a collision. In fact, the design of the Variocage tends to contribute to the dog relaxing and lying down while in motion. This keeps your dog calmer and contributes to their safety as well. A properly installed Variocage of the correct size offers the best protection available on the market for safe transport of your dog as well as all human occupants in your vehicle. To assure a proper fit, please use the link below to see the measuring guide on our website. The detailed instructions will provide you with information on how to properly measure your dog and your vehicle for a Variocage. When measuring your dog, please remember that the Variocage is a transport cage and it is not a kennel. Transport cages serve a specific application and therefore have specific requirements. A kennel is not designed for the safe transport of your dog. Professional handlers typically use the correct size cage based on the measuring instructions found here on our website for transporting their dog. There may be instances when the size of your dog and/or your vehicle may require you to make certain exceptions to the recommendations made above. Large dogs that exceed the maximum length of the cage may require the use of a Double Variocage versus a Single Variocage, even when traveling alone. The width of a Double Variocage will provide them with the room they require that the length of the cage cannot. Restrictions on the length of the Variocage imposed by your vehicle may also require the use of a Double Variocage to allow enough room for your dog. Typically, we do not recommend putting a single dog in a larger oversize cage. A larger transport cage is not necessarily as safe for the dog and is not desirable from a safety perspective. However, you can transport several smaller dogs in a larger Variocage as long as they are always traveling together. NOTE: Please review the measuring instructions on our website to properly size your Variocage. If you are not sure exactly what size you need, going one (1) size larger than indicated by your measurements would be OK.
MIM Safe Variocage is designed for placement behind the rear seat (or a barrier similar to it) with the sidebars traveling in the direction of the car. This placement allows the cage to work with the car's crumple zones in the event of a crash. The Variocage is safest mounted level on a flat surface secured to the floor in your vehicle. It is important to use the straps provided with the Variocage to secure it to the tie-down hooks in your vehicle. These straps are integral to the safety design of the Variocage. The straps are engineered to give way in a severe impact allowing the crumple zone protection of the Variocage to work properly. Proper use of the Variocage relies on the crumple zone protection designed in to your vehicle and the Variocage. For best safety and by design, the Variocage must be facing lengthwise in the vehicle for maximum protection of both your dog and human occupants. Please make sure you measure your vehicle with this placement and positioning of the Variocage in mind. Why is it recommended that the cage be up against a rear seat-back when installed in a vehicle? MIM Safe Variocage is designed for installation behind the rear seat for added support in the event of a crash. The back seat and the resistance it provides play a critical role in the crumple zone of the Variocage. There are also tie-down straps that come with the cage to keep it secured to your vehicle's tie-down points. These straps are integral to the safety design of the Variocage. The straps are engineered to give way in a severe impact allowing the crumple zone protection of the Variocage to work properly. If the rear seat is folded down or removed, and only the tie-down straps are used to keep the cage in position, it can present a danger to both your dog and human occupants in the event of a severe impact. In most vehicles, there is a protective plate that covers most of the width and height of the rear seat. This plate is designed to prevent penetration into the rear seating area by the corners of hard or sharp objects being transported in the cargo area thereby helping to protect occupants from serious harm or injury. The front seats in most vehicles do not have a protective plate. They only have a frame. The frame is designed to withstand impacts but not penetrations by hard or sharp objects. In fact, putting a plate in a front seat might cause damage to rear seat occupants if they were to contact the plate with a body part or their head. The front seat typically allows for some cushioning for human occupants during impact yet still serves to protect front seat occupants from serious harm or injury. Placing any cage on top of a folded seat that does not fold completely flat into the floor can be hazardous. Any elevated position above the floor increases the risk of penetrating a seat with the base or lower corner of the cage. This position can also apply more force against the upper portion of the front seat, causing it to break. Also, if it is not secured properly to the floor, the cage is more likely to become a projectile in your vehicle placing all human occupants as well as your dog at risk of serious harm or fatal injury. If you do place a cage behind your front seat, please bear in mind that you are compromising safety when using this location. If you decide to put a cage in this position, please understand you do so at your own risk. MIM Safe Variocage cannot recommend this installation. The cage must be placed up against the rear seat and secured to the floor for the best possible result in the event of a crash. MIM Safe Variocage has not tested cages for crash protection when placed sideways in a vehicle and properly secured to a floor. Therefore, MIM Safe Variocage cannot recommend this placement since no test data is available for this type of installation. Placing a cage on a rear seat is never recommended. The cage cannot be properly secured in this location and it places the cage at an unsafe height in the vehicle. MIM Safe Variocage does not recommend this installation in a vehicle. MIM Safe Variocage can be installed in a Minivan or SUV with the 3rd row seats folded down or removed. The 2nd row captain's chairs would then act as the rear seat. This should work even if there is a gap between the Two (2) Seats. Please make sure the MIM Safe Variocage is strapped down properly to the anchor points in your vehicle and that you have support from the 2nd row seats for the cage. The reason for the outer tubes being shorter is to prevent the door from getting caught in the rear entryway opening and to allow the MIM Safe Variocage door to open all the way. MIM Safe Variocage includes a removable divider with all Double cages. The divider is adjustable and will partition the cage so you can travel safely with two (2) dogs, one on each side. Also, when traveling with one dog, the other side can be used for luggage, groceries, supplies, and materials storage. In the event of a crash, these objects will be contained and not present a hazard to occupants in the vehicle. MIM Safe Variocage Double Models have only been tested with Two (2) dog dummies. However, if you have several smaller dogs you can transport them if they are all small enough to fit together comfortably in a larger MIM Safe Variocage. Transporting Two (2) smaller dogs in a larger cage is better than putting One (1) smaller dog in a larger cage. However, if you put a small breed in a Double XXL Cage by itself, and have a crash, the potential for harm is greater. A single dog in a smaller cage is better than a single dog in a larger cage. Yes. The dog can travel “sideways” in the cage. Owners of larger dogs have purchased Double Cages for big dogs requiring more room. In these cases, they take the divider out. Examples of this would be a large German Shepherd or a Rottweiler. MIM Safe Variocage Single, Double and Compact have not been designed for the very, very small breeds. These dogs are so small that the head of the animal may get stuck between the tubes. This can be a potential cause of injury for the very, very small breeds. For smaller dogs, as well as cats, we recommend the MIM Safe Variocage MiniMax, which has smaller openings between the bars. The MIM Safe Variocage MiniMax will properly accommodate smaller breeds as well as cats while keeping them safe and secure. The type of steel used is ASTM A366. There are a variety of dimensions used throughout the MIM Safe Variocage. The tubes are either 14 or 19 mm in diameter with a thickness of 1.0 mm. The flat steel used for the top and bottom sections have a thickness of 0.7 mm. Yes! Please make sure the MIM Safe Variocage is strapped down properly to the anchor points in your vehicle behind the 2nd row seats using the supplied straps shipped with your cage. These straps are integral to the safety design of the Variocage. The straps are engineered to give way in a severe impact allowing the crumple zone protection of the Variocage to work properly. Yes, if installed properly, the Variocage can be used in a pickup truck. You must place the Variocage in the bed of the pickup with the back of the cage against the rear of the driver / passenger cabin. The Variocage must be in this position in order to get proper support. This principle is the same as placing the Variocage against a rear seat for support in order to assure the crumple zone of the Variocage will work as designed. Can the Variocage be used in a RV or Mobile Home? Normally an RV is a vehicle with all sorts of solutions of the interior design. Ideally we would like to place a Variocage behind something rigid like a wall or rigid seat (driving direction is forward in his case). Unfortunately, most things inside an RV are not rigid in a crash. So then we have the choice of restraining it for it to not be too loose for normal driving. This would require screwing load hook rings or the use of something else inside to restrain it to the chosen positions. Then maybe reinforce it further with what can be used without limiting something else inside the RV. Straps to and around a top side tube end or similar would improve the restraining. Direction is not so important, there would never be a “rear end crash” that would need to use the deformability function of the Variocage as there is so much room. Placing it sideways is ok and probably improves the possibility to find a good spot as it can be adjusted in length to optimize the space available. Basically, because crash testing was not performed with an RV, we cannot guarantee that there is a safest way or place to put the cage in an RV. But our engineers cannot think of any other crate out there that could work better than a Variocage in an RV. A custom built crate with rigid attachments would POSSIBLY be a better choice, but even that is uncertain. It all depends on where it can be placed inside the RV. >One of the steps in the Variocage assembly manual is putting "soft material" 20mm underneath the kennel before you place it in the cargo area. What would you recommend for this "soft material"? We only recommend this if there is a threshold that is higher than the floor to take in consideration. Then having something under the cage to allow the doors to open is necessary. Otherwise there is no safety necessity to place anything underneath the cage. However, anything placed on the carpeted cargo floor over time may cause some chaffing or wear after a period of time. Something like a rubber WeatherTech Cargo Mat under the Variocage can help protect the carpets. Foam or an Anti-Fatigue Mat would work extremely well for this application. It is not a safety issue, but more something that helps customers who are particular about their cars, keep the interior nice. Step One: Measure the distance between the top panel seam and top panel leading edge (Diagram #1 – Measurement (A)) . Step Two: Measure the distance between the opposite top panel seam and top panel leading edge (Diagram #1 – Measurement (B)). Step Three: If Measurement (A) equals Measurement (B), no further adjustment is needed. If Measurement (B) does not equal Measurement (A), adjust Measurement (B) until it equals Measurement (A). To do so, loosen the black knobs on top of cage and adjust until Measurement (A) matches Measurement (B). Once Measurement (A) and Measurement (B) are equal, re-tighten black knobs. Please Note: If your cage rattles, you will need to compress the top of the cage. To do so, loosen the black knobs on the top of the cage, compress the top of the cage 1/8” to 1/4”, and retighten knobs. Make sure you follow the three steps above after you make this adjustment to ensure Measurement (A) and Measurement (B) are equal. Step Four: Measure the distance between the floor panel seam and the outside leading edge on the left side of the cage (Diagram #2). Step Five: Measure the distance between the floor panel seam and the outside leading edge on the right side of the cage. Step Six: If this measurement on the left and right side of the cage are equal, no further adjustment is necessary. If this measurement is NOT the same on the left and right side of the cage, adjust until this measurement is equal on both sides. To do so, loosen the black knobs on both sides of the cage and adjust until both sides are equal. Once both sides are equal, re-tighten black knobs. Note on Shipping*: All Variocage and Vario product orders over $300 ship with Indirect Adult Signature Required. FedEx will not allow us to make an exception to this and we cannot make changes to the shipping address once the order has shipped. If you will not be home for the delivery, you may call FedEx and sign in advance prior to delivery. Another option is to wait for FedEx to attempt delivery and sign the signature tag left on their door and leave it on your door handle. Once you have signed in advanced or signed the signature tag and leave it on your door, FedEx will deliver the order and leave the package even if you are not there to receive it. Once the call tag is signed, Pet Pro Supply Co. will have no liability for any claims made for lost or undelivered items. As an agility competitor, I have traveled a lot with my dogs. I cycled through a lot of popular brands of crates but always had issues with sizing and ventilation. I wanted the largest crate for my dogs (border collies) and this Double XL crate is literally perfect. I have it extended to the largest size in the back of my 2011 Ford Flex and it fits like it was made just for my car. It allows for my dogs to have plenty of space to stand, turn around and lay down. One big thing too is the ventilation, which is nothing like the other big brands I've owned. The escape hatch is an amazing idea and I love that the crate can lock at the front doors! The crate does not rattle and still allows for me to see through it when using my rear-view mirror. I would absolutely buy this crate again. Purchase the double medium size which fit into my new Jeep 2018 Wrangler JL perfectly. Assembly went well. A lot better than my previous wire crates and safer for the Zeus & Zoe. I am very happy with this product. It is very quiet and well made. I had trouble with Fed Ex. They said that they would deliver the product on a specific day, but it did not arrive. It rose on the truck for an extra day because the people loafing the truck did not scan the item. Therefore, the driver could not deliver the item because it wasn't on her manifest. I hope I never have to deal with Fed Ex again. It is a very disorganized company. The driver told me that, and she was very disgusted with the company.